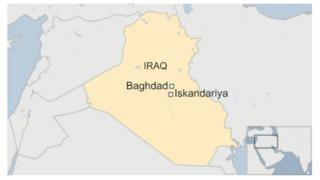 At least 29 people have been killed in a suicide attack in a crowded park in the Iraqi city of Iskandariya, officials have said. The bomber detonated the explosives at the end of a football match, wounding more than 60 others, according to police and medical sources. Iskandariya is a mainly Shia town 40km (25 miles) south of the capital, Baghdad. IS, a mainly Sunni group which controls large swathes of northern and western Iraq, has attacked numerous Shia targets in the country recently. A local police captain said the suicide bomber blew himself up in the crowd as the trophy was being handed to the winners, AFP news agency reported. The town's mayor was among those killed, the agency added, quoting an unnamed medical source. Iskandariya is in a region that was once called "the triangle of death" and was badly affected by sectarian violence that followed the 2003 US-led invasion of Iraq. Meanwhile, the powerful Shia cleric Moqtada Sadr urged Prime Minister Haider al-Abadi to implement government reforms within 24 hours. Mr Sadr warned authorities they would face street protests if a new-cabinet and fresh measures to fight corruption were not introduced by Saturday. The ultimatum was made in a statement read to thousands of his supporters staging a sit-in outside the gates of the heavily fortified Green Zone, an area of government offices and embassies in Baghdad. Plans for a cabinet re-shuffle were announced last month, but Mr Abadi has been slow to implement the changes.